I'm wanting to show that a parent spent time in foster care as a child. I have seen some genograms where they just have a shape like a star beside the parent shape, however I can't work out how to add anything like that. Urgent help would be hugely appreciated. What about creating the Foster Parents/Foster Family, and then right click on your Parent and "Link as Child" to the Foster Parents. You then click on the link, and can select from biological, adopted, or foster child. 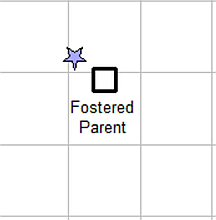 Perhaps make a Household around all of them .... select the individuals in the Foster Family, including your Parent, then right click and create Household, and add a date range as a label? GenoPro does not have a facility to add predefined geometric shapes, but freehand shapes can be drawn with the 'New Arrow' tool on the Standard Toolbar (or press A key). However it is difficult/impossible to draw precise shapes this way. An alternative is to draw the shape using an SVG editing tool and edit the resulting SVG xml to provide a Shape element in a GenoPro XML file. Download the attachment and open with GenoPro and then copy and paste the star into your own .gno as required. The Shape's colours and comment can be edited with GenoPro. The Comment will be used as a tooltip.